I see in Lunaya Pravda that Luna City Council has passed on first reading a bill to examine, license, inspect—and tax—public food vendors operating inside municipal pressure. One might define adulthood as the age at which a person learns that he must die ...and accepts his sentence undismayed. My word, I'm not even a hundred yet. The Moon Is a Harsh Mistress has much—maybe too much—to appeal to followers of all Robert Heinlein's diverse interests. For science fiction fans, with an emphasis on science, it suggests interesting ideas for how a colony on Earth's moon may be set up and how communication and transportation may be arrangedâ€”not to mention the story of a computer gaining sentience. For those with a penchant for space opera, it has the requisite extraterrestrial battles and intrigues, with empires rising and falling. For right wingers who were stirred by Heinlein's militaristic bombast in earlier works like Star Troopers, this novel offers plenty of rabble-rousing, libertarian politics. The phrase "there ain't no such thing as a free lunch" is popularized here by the author, who often shortens it to "TANSTAAFL". For lefty counterculture-types, who got off on Heinlein's maverick social critiques in earlier works like Stranger in a Strange Land, this novel gives a sympathetic picture of radical practices like group marriage and communal living. For both left and right, the overriding plot of the lunar colonists rebelling against Earth's oppression purposely reflects the American Revolution against British rule. That's a lot to pack into a science fiction story of a few hundred pages, but there's lots more. This is a novel packed with provocative ideas, as Heinlein's fictional mouthpieces throw out one thought after another on revolution, on warfare, on politics, on psychology and sociology, on free love.... They come from the aforementioned computer, code-named Mike, who sides with the revolutionaries, acting as their logistics organizer while trying to understand simple human faculties like the ability to tell a joke. Or they come from Manuel, the polygamous regular guy who leads the rebels into action. Or they come from the group's theoretician Professor Bernardo de la Paz—especially the political and strategic ideas. The Moon Is a Harsh Mistress is really the scifi equivalent of a literary novel of ideas. But as in most of its literary parallels, it suffers from an imbalance: there isn't room to really develop the characters and story with any nuance. Even the development of the ideas is either rushed or abandoned altogether. To some extent this is a blessing. We're relieved not to have to go through the bizarre plot twists that would be necessary to fully examine some of the wilder ideas. And the characters are forced to find political compromises, lending the novel in its latter chapters a more relaxed feeling, as if Heinlein is saying, "See, I'm not a complete dogmatist. I only want to provoke ideas, not force them down anyone's throat." Still, there's an air of unreality about the story. And not just because it's speculative fiction. Even the most bizarre SF tries to make the reader buy into the scenario. But everything here just moves along too quickly and too easily. Every step of the ragtag-led revolt proceeds neatly, with allies and enemies and circumstance appearing just when they are most propitious. All swiftly goes along according to plan. Worse, every part of the character's lives—and deaths—fall into place too neatly. As with other science fiction featuring people without dimensions or shadings, it's the computer-generated entity, striving to become human, that is most intriguing. But even this character development ends disappointingly. Around this time, Heinlein was transforming himself from an action novelist into a full-time polemicist. The latter is also an honourable profession. But it's not quite the same thing. The Moon Is a Harsh Mistress arrives partway through this transition and both benefits and suffers from it. Obviously many readers find it a good place to be in. 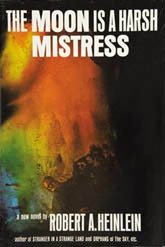 The Moon Is a Harsh Mistress has been called the masterwork of the greatest science fiction writer of his time. Writers in several genres claim this work as inspiration. And the novel does have admirable qualities. Like everything by Heinlein, it has some marvellous scenes, much inspired writing, highly quotable passages, new ideas and story lines you've never encountered before. All that and more. It just hasn't been written into a form that would do justice to all these fine elements. Heinlein is famous for refusing to edit his writing except as demanded by financial exigencies. But a reworking of his story in The Moon Is a Harsh Mistress could have stripped away dead ends and added depth to the most fruitful narratives and most interesting characters. It is a successful novel. But it could have been so much more.